Method: The day before the preparation, marinade the venison with all the ingredients of the marinade. On the day of the preparation, rehydrate mushrooms by soaking them 20 min in warm water. Wash them several times and drain. Cook them in the pan with chopped shallots and half the butter. Season. Keep aside. Cut root vegetables in “chips”. In a pan brown them in the duck fat for a few minutes, then cook in the oven (200°C – Gas mark 6) for 25 min until they are cooked but still a little crisp. In a hot pan, seal venison fillets in a little duck fat. Deglaze with sauce, adding a dash of single malt in the end. Finish cooking the meat in the oven for a few min (depending on how you like it cooked). In warm plates, place fillet on mushrooms and lace with sauce. Add root vegetables on the side. 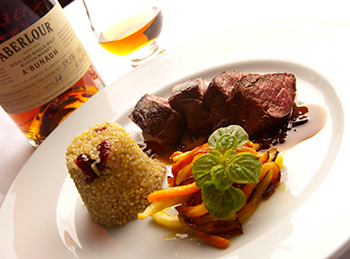 The pairing: The venison calls in for a powerful whisky. A’bunadh was the obvious choice: the rich aromatic palette of sherry, together with an oaky structure matched perfectly with the cocoa sauce. Alternatives should be looked for in the same aromatic spectrum: Benrinnes, Glenrothes, Glenfarclas or another option, a peated whisky with a sherry influence: for example Ardbeg Uigeadail or a Benriach from the Fumosus range. The root vegetables balance the oakiness with a sweet touch.